I almost didn’t notice I was wearing it, at first. The plastic box strung around my neck was roughly the size and weight of a deck of cards, lighter than I expected. It was only when I spotted the occasional flash of blue light that I remembered this “sociometric badge” was listening to everything I said, where I said it, and to whom—especially if they were wearing a similar device around their own necks. In those cases, our conversations were captured for analysis—ignoring what we said in favor of how long we spoke, and who did all the talking. I started to turn painfully self-conscious around my first visit to the bathroom: Did the badge know I was in there? Would it listen? Would it freak someone out that I was wearing a giant sensor in the stall next to him? By the time I left the building for lunch, I had zipped it beneath my jacket, less concerned that it was counting my every step than having civilians think I was some new species of Glasshole. Like Google Glass, sociometric badges were prototyped in Alex “Sandy” Pentland’s Human Dynamics Lab within the MIT Media Lab—a place where his cyborg doctoral students once wore keyboards on their heads and no one thought it strange. Unlike Glass, the badges are still a going concern—five years ago, Pentland and several former students spun out a company now called Humanyze to consult for such companies as Deloitte and Bank of America. Just as Fitbits measure vital signs and REM cycles to reveal hidden truths about their wearers’ health, Humanyze intends to do the same for organizations—only instead of listening to heartbeats, its badges are alert for face-to-face conversations. For two weeks in April, Fast Company was one of those subjects. (Humanyze provided the badges and analysis for free.) Twenty Fast Company editorial employees—and me, as a visiting observer—agreed to wear the badges whenever we were in the building. Our goal was to discover who actually speaks to whom, and what these patterns suggest about the flow of information, and thus power, through the office. Is the editor in chief really at the center of the magazine’s real-world social network, or was someone else the invisible bridge between its print and online operations? (Or worse, what if the two camps didn’t speak at all?) We would try to find out, though we would be hampered somewhat by the fact that not everyone was wearing a badge, and we didn’t give Humanyze the full range of data, like integration into our email and Slack conversations, that would allow the company to truly understand our work relationships. More importantly were the questions we chose to not ask: How did these patterns impact performance? Should editors and writers talk less or more, and what did it mean when they talked amongst themselves? Did it result in more posts on Fast Company’s website, or more highly trafficked ones? Demonstrating and understanding these relationships are what Humanyze’s clients pay for; perhaps we were too scared to learn. For the better part of two weeks, staff members suffered the badges in silence. Some people found wearing them uncomfortable and awkward. “It was oppressive,” says associate news editor Rose Pastore. “I think it ruined my posture.” “It does not play well with statement necklaces,” says senior editor Erin Schulte, who, like many others, resented needing to wear the badge on her sternum for maximum audio fidelity (and so the infrared sensors that establish the wearers’ identities have a clear line of sight). Several wished it could be a pendant or lapel pin or wristlet—anything less intrusive. Others complained about the user interface, or lack thereof. The blue twinkling I’d noticed was only one of several colors, none of which had been explained during orientation. Some found this Orwellian; others reported being lulled into complacency by its low-tech appearance and cheap plastic casing. Still more wanted feedback: Was this thing on? Was I doing this right? Cognitive dissonance soon manifested. Writers and editors who complained in one breath about opaque surveillance suggested in the next that only if the badge could replace their Jawbone UPs and Fitbits—in the process capturing their quantified selves for their employer—would the exercise be worthwhile. Humanyze CEO Ben Waber understands their concerns, from the interference with statement necklaces to the deliberate lack of clarity from the badges. “Lights blinking all the time is distracting,” he says. “It’s a difficult line to manage.” As far as the wearer’s comfort goes, he’s confident that Moore’s Law will reduce the weight of sociometric badges until they are indistinguishable from standard-issue IDs. (The latest version of the badge, which we did not wear, is half the size of the previous iteration.) But he’s adamant that the badges will always be worn on the chest, as it’s the only way to guarantee conversations will be heard clearly. Humanyze prides itself on privacy. Several weeks after our badges had been shipped back to Boston for analysis, we each received a link to our individual results. Not only was this data shielded from our employer, we were assured, but Fast Company was also contractually forbidden to ask us what was in our reports. Which explains why Laura Freeman, the “quantitative social scientist” who prepared our reports, was audibly dismayed when I announced my intentions to reverse-engineer them. The true org chart of Fast Company, based on whom workers interact with. This made it easier to locate my likely position on the periphery of the network map created by the badges (pictured above). 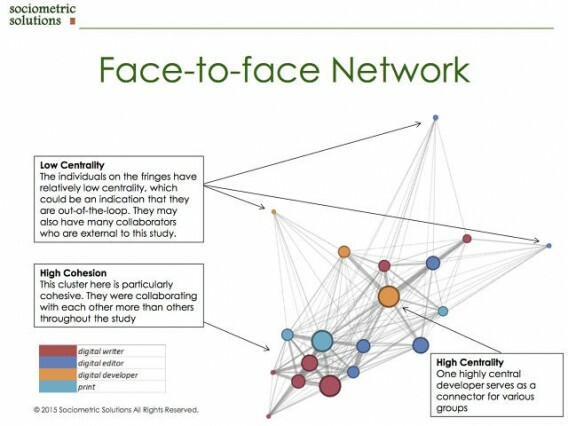 My best guess is that I’m the node at the very bottom, confined to speaking with my fellow “digital writers.” We were a chatty group; one of the few surprises was that the seven writers talked more amongst ourselves than any other group (which included an equal number of digital editors, along with a smattering of magazine editors and developers). “Surely, they must be complaining,” said Cliff Kuang, Fast Company’s director of product. The other surprise had to do with Kuang himself, who was revealed to be the center of the network. He was the only participant with strong ties to multiple members of the other groups. Editor-in-chief Bob Safian, it turned out, had stopped wearing his badge after only a few days and was likely on the fringes. Executive editor Noah Robischon’s position as one of several highly connected digital editors was impossible to determine. But Kuang’s central role makes perfect sense in retrospect: As director of product, he straddles multiple domains, and as a former editor of Co.Design, he has prior relationships that aren’t reflected on the org chart. 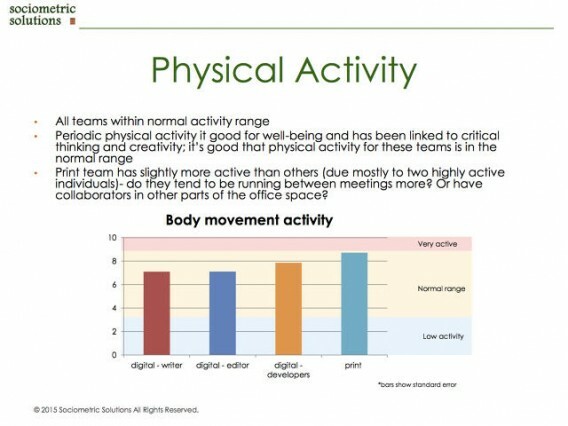 Humanzye also measures how much people on each team move. Unearthing those relationships, understanding and visualizing them, is perhaps the most potent thing sociometric badges can do. For more than 30 years, the sociologist Ronald S. Burt has mapped and described what he calls “structural holes”—the naturally occurring gaps within organizations. Those who bridge these holes, he has found, produce more ideas, make better decisions, and prosper accordingly. But they aren’t necessarily the ones in charge. To demonstrate, Burt recently mapped the relationships between top managers at one of the largest pharmaceutical giants in the world. He discovered a relative nobody several rungs below the CEO who appeared to be the only person keeping the company’s Asian leadership tethered to the mother ship in Europe. When the results were published, Burt told me, the company immediately began grooming him for leadership. Our experiment had no such tidy ending, however, which leads to the questions posed by critics of the trackers and the quantified workplace: What can this data be used for besides squeezing more work out of its users? There are few use cases outside of fixing the bottom line. If we had a specific business goal, perhaps the data could have been used to make changes to achieve that, but the information didn’t do much to improve individual workers’ understanding of their jobs. Their thoughts might best be captured by a stray thought of Clendaniel’s as we paged through Humanyze’s analysis: “There are few use cases for personal improvement here, and many more for productivity and efficiency.” He wasn’t being particularly positive.